The Keysight E5071C is available to buy refurbished used or rent, usually from our UK stock. Click here to download the Keysight E5071C datasheet. The Agilent E5071C ENA Series RF network analyzer is the ideal solution for manufacturing and R+D engineers evaluating RF components and circuits from 9 kHz to 8.5 GHz, featuring an integrated 2- or 4-port, the highest performance, extended lower frequency range and fastest speed in its class. The ENA Series significantly reduces cost of test through its ability to cover such a wide frequency range in a single instrument. The Agilent ENA series addresses a broad array of component and circuit tests including EMC-related applications and automotive, wireless communications, aerospace and defense, education, and medical applications. The ENA series is a replacement for the legacy de facto industry standard: Agilent 8753 RF network analyzer. The lower-end frequency is 9 kHz without built-in bias tees and 100 kHz with built-in bias tees. Built-in bias tees and AUX inputs for DC measurements allow the ENA series to replace Agilent 8753 in DC-biased measurement applications and amplifier test applications, respectively. The built-in probe power also allows active probes to be used without an external probe power supply. In-circuit testing can be done using the high-impedance probe. The ENA series provides exceptional performance with industryleading dynamic range (123 dB), trace noise (0.004 dBrms at 70 kHz IFBW) and fast measurement speed (39 ms at 1601 points, 2-port full cal). The ENAs measurement capabilities enables the design of high performance components with a short cycle time. Built-in 2, or 4 test ports provide simultaneous measurement of all signal paths for components. This advanced architecture minimizes the number of sweeps to complete a multiport S-parameter measurement and dramatically improves test throughput. 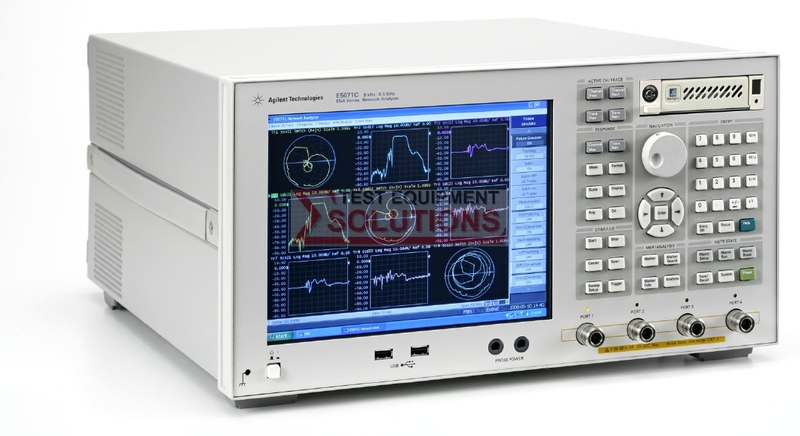 We offer the refurbished used Keysight (Agilent) E5071C 4.5, 6.5, 8.5, 14 Or 20GHz Vector Network Analyzer for sale and rental. The Keysight E5071C is fully tested and refurbished in our in-house ISO9001 calibration laboratory. We supply manuals, accessories, full warranty and a free-of-charge Certificate of Conformity. We can also provide the Keysight E5071C with a fresh calibration for a small additional charge. If you have under-utilised test equipment talk to us about trading-in or part-exchanging it towards the Keysight E5071C or other refurbished test equipment.